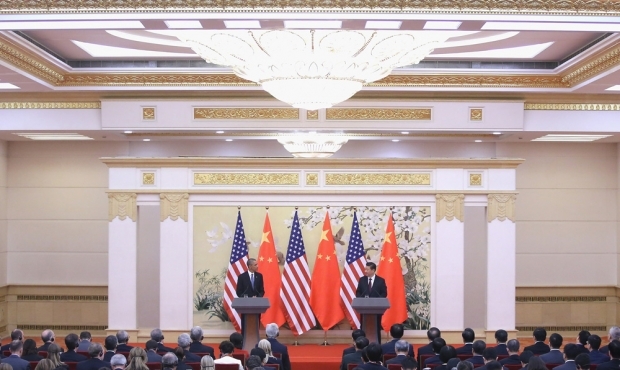 U.S. President Barack Obama and Chinese President Xi Jinping hold a press conference at the Great Hall of People on November 12, 2014. President Obama was in Beijing for the 22nd APEC Economic Leaders’ Meeting where the U.S. agreed to cutting carbon emissions by 26 to 28 percent by 2025, and China on capping its emissions by 2030 and significantly increasing its reliance on alternative energy. Obama Called the Agreement “Historic.” Chinese State Media Yawned. The United States has been using some frothy language to describe its joint statement with China on forestalling climate change. In a breathless New York Times editorial, U.S. Secretary of State John Kerry referred to it as "something of great consequence," a "major advance," and a breakthrough that "marks a fresh beginning." At a November 12 press conference in Beijing, President Barack Obama called it an "historic agreement" and a "major milestone in the U.S.-China relationship." Contrast that, however, with how the Chinese side framed it. Side by side with Obama in Beijing, Chinese President Xi Jinping said: "We issued a joint statement on climate change, and we jointly announced our respective post-2020 targets." The enthusiasm gap for the agreement—which has the United States cutting carbon emissions by 26 to 28 percent by 2025, and China capping its emissions by 2030 and significantly increasing its reliance on alternative energy sources like hydro- and nuclear power—was hard to miss. Both sides put out their joint statement, the U.S. issuing it via the White House and China releasing it through the official Xinhua News Agency. But whereas one side gave it a high gloss, the other seemed to be trying to bury it under the rug. The top story on the website affiliated with the Communist Party flagship paper People's Daily was about Xi and Obama meeting the press—but the article made no reference to the climate agreement. Other stories on the homepage touched on the climate statement but tended to relegate it to the latter half of the article, and omitted the American-style superlatives. The popular Beijing News, a state-run paper known for gently testing the editorial boundaries, also didn't mention the climate deal in its November 12 cover story on the APEC meeting that brought Obama to China. It focused instead on the meeting's anti-corruption accord and progress on plans for a pan-Asian free trade zone spearheaded by China. But whereas one side gave it a high gloss, the other seemed to be trying to bury it under the rug. The Obama administration's spin on the deal seemed aimed at drumming up support for the non-binding targets back home. That could be a tough sell. Already Obama is being criticized for the agreement, which was labelled by Republican Mitch McConnell as part of the president's "war on coal." But packaging emission reduction targets for the United States together with Chinese concessions on greenhouse gas emissions could make them a little harder to criticize. That may help explain Washington's rhetorical excesses—but why the apathy from Beijing? It may be that Chinese doesn't want to be seen to be bowing to international pressure to curb its greenhouse gas emissions. China has been firm in espousing the principle of "common but differentiated responsibility" when it comes to climate change. The idea is that the lion's share of the burden should fall on the shoulders of developed nations, which have been emitting greenhouse gases the longest. In December 2009, then-Premier Wen Jiabao made it very clear that the main responsibility for climate change lay with Western nations, which fueled their industrial revolution with coal—decades before China revved up its manufacturing machine. At the Copenhagen climate summit that month, Wen said it was "totally unjustified to ask" developing countries like China to "undertake emission reduction targets beyond their due obligations." Since then, China has softened its position, now acknowledging that regardless of the historical context it too must act to prevent a global climate catastrophe. Alex Wang, a law professor at University of California Los Angeles and expert on China's environment, told Foreign Policy that "the idea that China should have no limits simply has become an untenable position." China's emissions, he noted, now "far exceed everyone else, per capita emissions have surpassed the EU, and historic emissions will soon catch up with the United States." So why isn't Beijing celebrating and advertising its new willingness to do something for the greater good? Deborah Seligsohn, an expert on the Chinese environment at the University of California San Diego, told Foreign Policy that Chinese leaders "tend not to enthuse," so that may in part explain Xi's reserve. But she also said that Beijing is under fire domestically for its unsuccessful efforts to curb local air pollution, noting that people were furious that authorities managed to clear the air for the visiting APEC dignitaries but can't do it on a daily basis for their own citizens. "There may be worries that focusing on climate change rather than air pollution doesn't meet the public's main concerns," Seligsohn said via email. And indeed, on Weibo, China's version of Twitter, there were grumblings over the joint statement, with one commentator in eastern China's Zhejiang province wondering why Beijing was signing an accord with the United States on climate when those who are suffering the most due to China's emissions are the Chinese people themselves. "Whomever can commit to capping emissions now and starting to reduce from here, they can have the support of the Chinese people."